It’s been a more relaxed pace around here this past week. Client work is historically slow in April, I guess due to it being tax time. So this is when I usually plan time to work on my business more than in my business, meaning that I do my annual blog audits and deep updates, just like I do for my site audit clients who return every 12-18 months to get a checkup. But, there are always a few fires to put out, and research to be done. First up, I want to remind everyone in the DIY SEO course that we start our Content Revamp series of workshops this week. Be sure to check for the email I sent on Monday with more details. I have 2 workshops listed for us right now, but I’m betting we’ll want to do at least one bonus session on this for you to ask questions about your specific content and the best options for what you want to do with it. The session this week covers how to do a content audit and make a plan for your changes. Our future workshops will cover best practices for actually making those changes, including ways that will help you avoid huge mistakes that are super hard and time consuming to fix later. It’s never too late to get into the course!!! We have replays for all the workshops, plus modules that are all video tutorials and keep up to date with the latest changes at Google and Yoast and such too. So come on and join us!!! Last week I ran into an issue while making my Gutenberg tutorials. I couldn’t save or publish a page after I had uploaded an image to it. Saved fine on blog posts. Turned out to be the Cloudflare WAF (Web Application Firewall) triggering a possible breach of security from my own IP address. I’ve also been working with 2 of my clients who are on the paid version of Cloudflare, along with the developer of the plugin they were trying to use, to get to the bottom of a similar issue they were encountering where they couldn’t save their work due to an API error. And they weren’t using Gutenberg. A couple years ago, WP rolled in a new REST API into the core. That allows an encrypted connection to WP for anything coming from the outside world, including you. Well, something is not right with it because it’s triggering these false flags on some functions. So, jump on over to the 2 posts I published yesterday on this for more, and the temporary fixes we’re using, and when we can expect permanent fixes. Yes, I moved to a new host last week and all is going well. My new home is at NameHero. It’s going to take time for me to vet this new host and I’ll have more for you as I go. As y’all know, I completed my speed tests a couple of weeks ago and this past week I moved on to do SEO testing of the lazy load function in two local caching plugins. They are both great. So, now I’m testing both of them on my own sites that are much heavier loaded than my test sites with a wider variety of plugins and functions. That is the last thing I needed to check before writing my posts for y’all on how everything performed. You can see the radical difference my tweaks made to Heartwood Art on the post I made to the BlogAid Facebook page. On Google PageSpeed Insight, I went from a score of 44 up to 95. One of the tweaks was the caching plugin change and the other was a dramatic change to the way I optimized the images, which I’ll tell you about later in the tips section. And this was on a theme that needs a lot of help with being brought up to the latest standards. And that brings me to my next big happening around here. I’m about halfway through the Gutenberg course creation. I have all of the basics tutorials done, plus creating a landing page, and how to make the most of Reusable blocks, which is one of the most powerful features of Gutenberg. 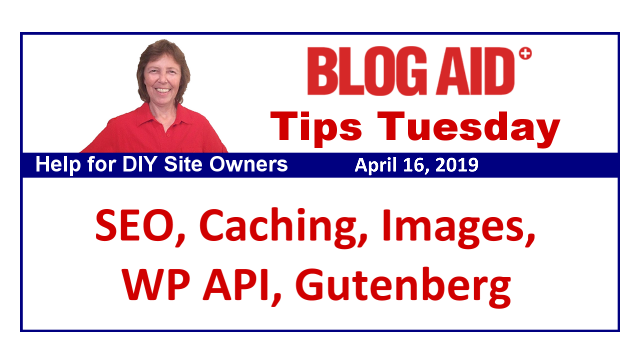 This week I’ll be diving into creating reusable templates and then I’ll be wrapping it up with the design blocks and block suite plugins and new themes that were created specifically to be used with Gutenberg. Oh, I’m itchy to get to those tutorials as they will radically impact my decisions with revamping the theme on my Heartwood Art site. Last week I published a post in the Hobby to Money Making Site series on the roll of storyboarding and photojournalism in blogging. And you can see those tips in practice on my latest post on the woodworking site for an Easy DIY Circular Saw Straight Edge Guide. The assembly took me less than an hour to make. But the tutorial took about 14 hours. The video tutorials I make for BlogAid take about :45 minutes of production per 1 minute of video. This thing took about 1:30 hours per minute of video. But, that time will decrease slightly now that I have most of my video production process worked out for it. During my research for how to make some of my shop things, or get ideas for what I wanted to build, I really appreciated seeing videos where folks just filmed themselves building the thing, sped up the replay, and maybe did a voiceover for it. And I sure wish I could do that too, as it would be way faster. But, since these are one-off builds, and my first, and only time doing them, I don’t have that luxury. I will have it when I start creating the wood wall art and other art, like birdhouses and such, that I’m building out this shop to make. I’ve got another video tutorial in the works for this week on how to safely cut plywood on the floor. And it will have a combo of still shots and several short video clips combined. So that will be another first to produce. It will take me all week as I’m doing these after regular office hours. Main thing is, I’m learning a lot about video production – from the planning all the way through to new techniques in Camtasia. And that’s worth taking the time to do, as it will really pay off for making even more videos. After I finish that one, I want to explore making the short teaser videos with something like wave.video, as I mentioned a couple of Tips Tuesday’s ago. Did any of y’all try that platform? Leave us a comment here on the blog or anywhere you see this post online. And I’ve got a new post coming for you in the Hobby to Money Making Site series about setting your expectations, and how they differ from setting goals, and how to keep yourself motivated. So look for that soon. I want to thank everyone who came to the Tips Tuesday Livestream last week and for sharing your tips about which photo processing softwares to check out. I’ve checked out the Adobe options for Lightroom and Photoshop. But, I’m also seeing that GIMP has many of the features I need. Not only can it do what I need with the photos, but it can also make the graphics part of them too. Plus, it can replace the super old program I’m using to make BlogAid graphics. Not to mention that it’s free. I’m going to dig up some tutorials for it to get me up to speed quickly for the processes I do now, and to learn the new ones I need for photos. I did try GIMP for compressing some of the images I had already done in my other program, and it did compress them more. And I see that folks still have to run their images through another compressor when using Adobe products if they make graphics with them. I think it does an okay job of compressing jpgs, but not pngs, which is the format I save graphics in. My definition of a graphic is something that has mostly text on it and not so much pixel and color depth. I also tried other online image compression tools and apps. That’s not a typo. Squoosh really did take the image from 540kB down to 58kB. And this is one of the easy changes I made to get that radical speed improvement on my woodworking site that I mentioned above. Now, I only did it for the one post I tested, but you better believe I’ll be doing this for all future posts!!!! Check out this video tutorial on using Squoosh from my buddy and fellow webmaster Larry Snow. And do check out the rest of his YouTube channel as he has some super tutorials for MailChimp and securing your social media accounts too. One of the best things about Squoosh is that it allows you to save your images in one of the newer file formats. I saved mine in MozJPEG, which was invented by Mozilla, the makers of the FireFox browser. It has been around since 2014 and is supported by all browsers. WebP is another new file format. It is made by Google, but browsers have been slow to adopt it. I’m slow to recommend it because Google has too long a history of creating things that don’t get wide support and then dropping it. Squoosh also supports a couple of PNG formats too. But, I’m sticking with the MozJPEG for any image even if it has text on it, as the file size is so low and I still get better color depth on it. One of the other tweaks I made on Heartwood Art to get that radical jump in performance and better score on the speed testers, was to put the premium version of WP Fastest Cache on it. Wow, did that ever help with the lazy loading of images and even the YouTube video. This week I’ll be testing WP Rocket on the same blog post. In my speed test case study, WPFC and WPR were neck-and-neck. And that’s an improvement for WPFC compared to my tests last year. The big addition has been lazy load. But it goes past that. Even though I had the test site fully loaded with the most common plugins we all use, my woodworking site has many more plugins that will really put the screws to a caching plugin. So, I’m looking forward to doing those tests this week and I’ll have a comparison post for you as soon as I can. But right now I can tell you that WPFC is the best free caching plugin of them all. There’s a new report in Google Search Console called Discover. There are 2 parts to this feature. Discover is part of Google Search. Folks can use it to stay informed about their favorite topics without having to query them. The 2nd part is the report in GSC of how your posts are showing up in Discover for folks. That’s different from the reports that tell you how well your posts are showing up for specific queries. Getting into the Discover feature is pretty tough because the topics can be rather broad. But, Discover users can tell Google to get more specific with what is shown. And I’m thinking we’ll have a better chance of showing up in those. For instance, WordPress is a pretty broad topic for me to follow. But WordPress security is narrow enough to see posts and videos on just that aspect of it. Now, the only folks that will see something in that report on GSC are sites where Google has accumulated enough data to display. And it only goes back to March of this year. So, give it time if you don’t see anything yet. And I’ll be making a tutorial for the DIY SEO course as soon as I can. I know that my DIY SEO course members are now in the habit of checking their Search Console reports regularly. If you’re doing that and you suddenly see a big swing, it may be due to the Google De-Indexing Bug I reported on last week. Even though they said it was fixed after 6 days of de-indexing sites, Barry at SEO Round Table is reporting that it’s flowing through the whole system sort of like a virus. It’s now affecting reports in Search Console. So, go read his post about it to help you not freak out over sudden changes in your reports. I’m known for my due diligence when reporting anything to y’all. It’s a very nice thing to be known for. And I love this guest post by Ann Smarty on Denise Wakeman’s site with the seven tools she uses to create better researched content. Plus, you can use many of these tips to get good blogging ideas and titles too. So, do go check it out.